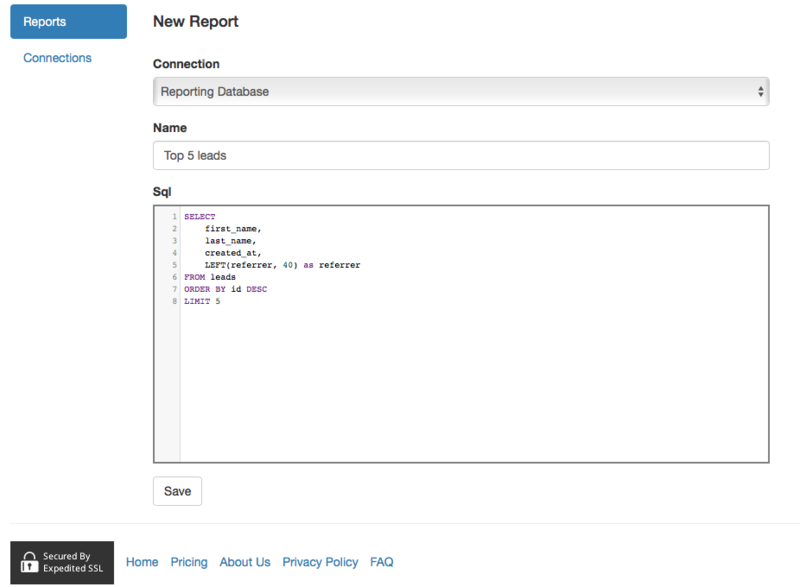 Write SQL reports, get them in Slack & email. Schedule them daily, weekly or monthly. 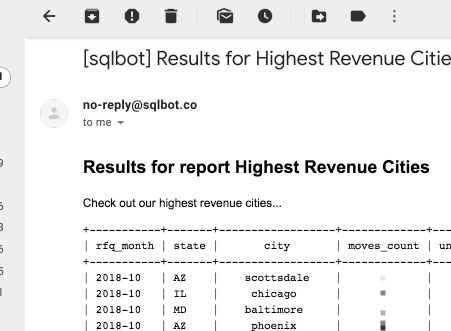 Simple SQL Slackbot & Email reporting. All the new kids brag about their "no-SQL" databases. Phooey. Real businesses still use SQL. Create a SQLBot account for free, write SQL to your heart's content and show those young hipsters who's boss. 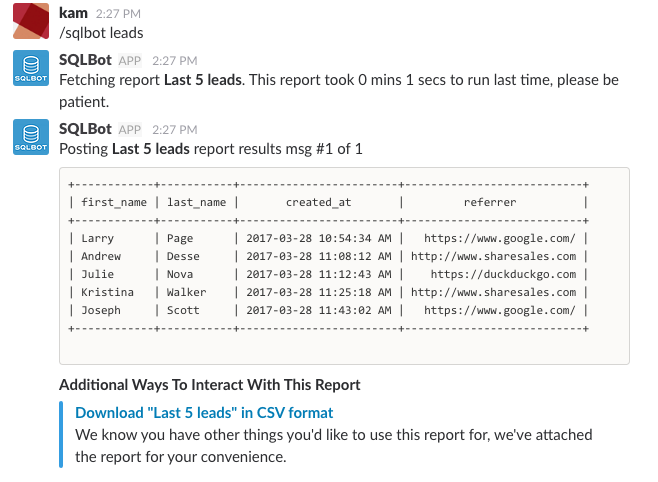 Need reports in Slack? 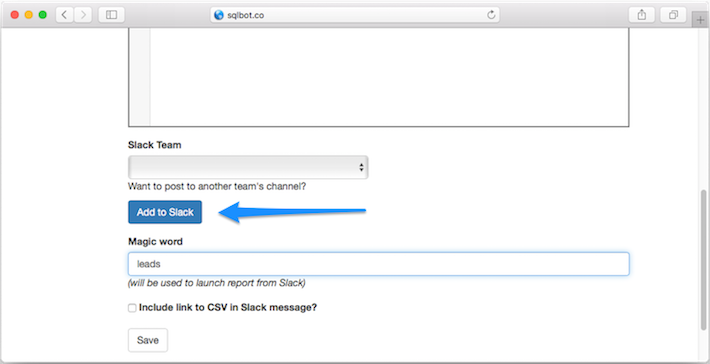 Click "Add to Slack", then sign into your Slack account directly from SQLBot; choose a channel and a command name. That's it. Want to schedule reports to go out by email? Put in the emails of your recipients and choose when your reports go out. Bam! 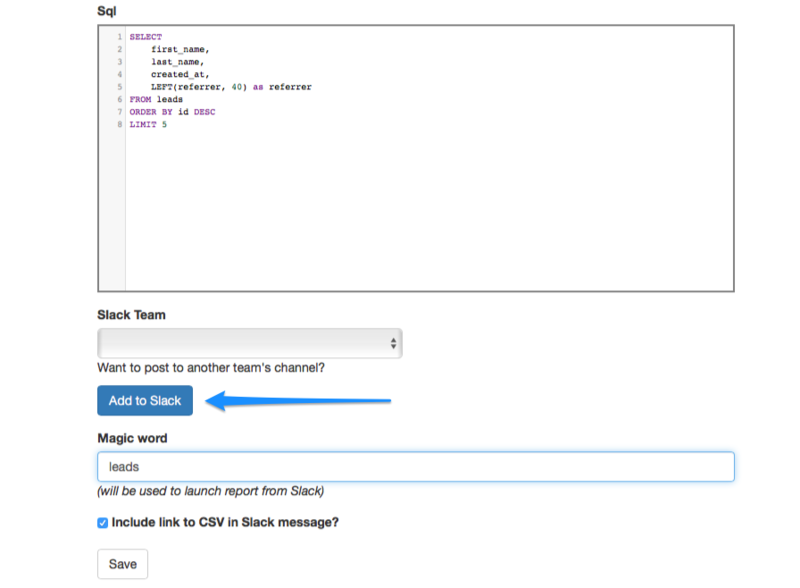 Pop into slack, lay down a "/SQLBot 'report magic word'" command, and wham! Results smack you right in the face. 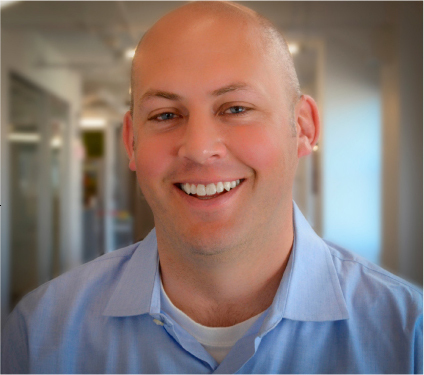 Need to email reports out on a schedule? Easy as Pie! Click "Schedule Email", and choose your send schedule. Your recipents get an email with a table of results and an attached CSV. Smile when your boss gives your "empoyee of the month" award. 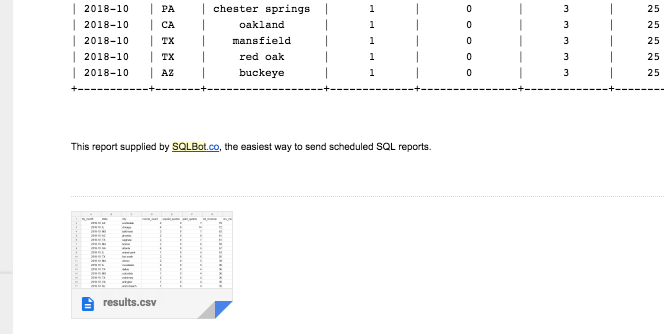 SQLBot makes SQL reporting in Slack & Email so simple your grandma could do it. In her sleep. It took me years to embrace SQL. Data isn't meant to be structured, and "Query" is just a fancy word for "Search"! But after years of resisting, I finally got in line. Then, the other day, my boss asked me if I could put some reports in Slack. It's just a newfangled version of IRC, with weird colors! My whole fight against SQL flashed before my eyes. I was at an all time low. Then I found SQLBot! 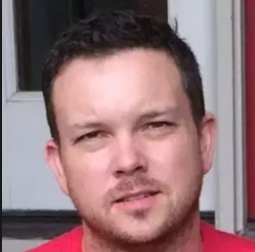 I can write SQL, and don't have to mess with all the Slack mumbo jumbo! I was preparing myself for a decade-long philosophical war, and now I don't have to. The boss man gets his reports in his fancy GUI, and I can go back to doing what I do best. Debating the pros and cons of various COBOL compilers on Reddit. Take your no SQL databases and shove 'em. I grew up on SQL, and still eat it for breakfast. In fact, I once spent 4 years avoiding any fancy "user interface" and working directly in SQL. I was like Tank from The Matrix, but instead of looking at falling green characters I stared at left outer joins. Slack rocks. You know what doesn't rock? Getting SQL report results into Slack. 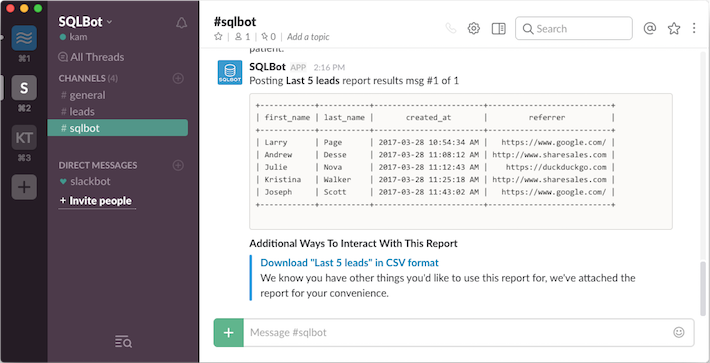 Before SQLBot, getting SQL results into Slack meant building a hubot Slack bot, calling Heroku dataclips to get their JSON results, formatting those in CoffeeScript, and dumping them into Slack. SQLBot makes this a thousand times easer and a million times faster, worth its weight in gold. We use SQLBot to gain immediate insight into key customer trends, it's an amazing service! I integrated it into the DreamFactory Slack account in minutes and pull reports with simple commands. It works great! The ability to schedule reports daily and weekly means our team is always up to date on our key numbers. 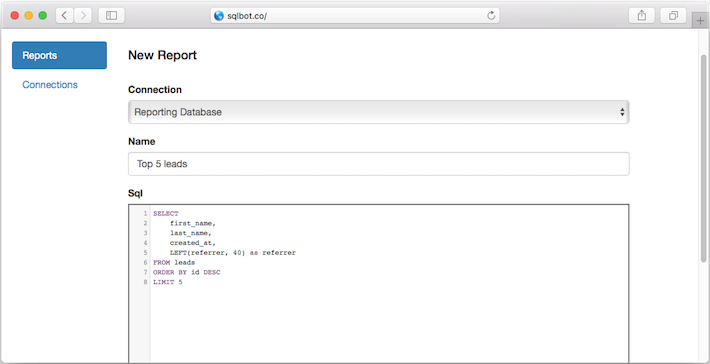 You can access data in any popular SQL database.